Danxia Landforms, named after Mount Danxia in Guangdong province, are stunning geological formations that are unique to China. They were formed when red sandstone and other minerals were deposited by rivers over a period of about 24 million years. These deposits settled into distinct layers and, after another 15 million years, faults in the earth created by tectonic plate movement caused them to become exposed. Over another few millions of years, they were moulded into strange shapes by weathering and erosion, resulting in the unusual landforms that we find today. Yet the ones near Zhangye are arguably the most spectacular as, rather than just being made up of fiery red sandstone, the hills are a flurry of vibrant colours that resemble a living watercolour painting. For this reason, they have earned the nickname the “Rainbow Mountains”. Nowadays the Zhangye Danxia Landform Geological Park is the best place to get to grips with this alien terrain. It’s located at the northern foothills of the Qilian Mountains, which only serve to amplify the scenic quality of this magnificent place. 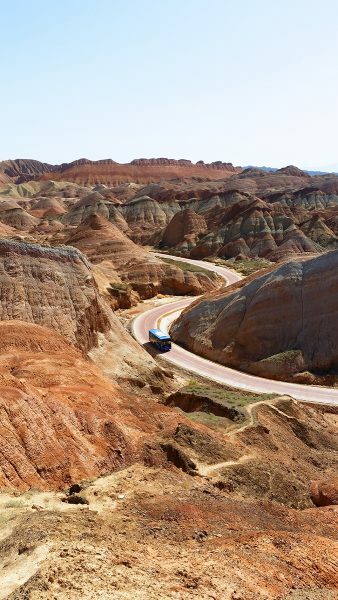 The Linze Scenic Area just 30 kilometres (19 mi) west of Zhangye forms the core of the park and is the most popular area, exhibiting the famous “layer cake” hills whose perfect stripes of colour resemble a well-made trifle. Just don’t go trying to take a bite out of them! The Binggou Scenic Area is not quite as popular or as well developed for tourism, but rests on the northern bank of Liyuan River and offers unique, isolated views for those more adventurous hikers. From the shimmering lakes and bubbling brooks to the extraordinary shapes and colours of the rippling hills, the Zhangye Danxia Landform is a work of art that you can literally walk on.